We are living under the judgment of sin. Indeed, all sin has undergone judgment and condemnation through Christ crucified. And still the world remains unconvinced of this startling fact and continues to value sin and even to produce and manufacture materials for the very purpose of leading people to sin (just take a look at some of the books being marketed to teens). Dear God, who will you send to convince us of sin and judgment? “Who can dare to die,” asks Father Faber, without first embracing Jesus Christ as Lord and Savior and repenting of one’s sins with tears of sorrow? In the second part of his encyclical on the Holy Spirit, Dominum et Vivificantem, Saint Pope John Paul II spends a considerable amount of time and effort discussing the Holy Spirit’s role or mission as the one sent to convince the world about sin and judgment. It is significant that the Pope felt it was necessary to devote such a large portion of his encyclical on the Holy Spirit to this rather discomforting subject (would we not rather read about those wonderful gifts, fruits and consolations of the Holy Spirit! ); apparently the Pope felt that we are a people in need of convincing when it comes to the horrible reality of sin. Indeed, there are those in the world who even dare to call what is evil good. Part II of the Pope’s encyclical on the Holy Spirit is entitled, “THE SPIRIT WHO CONVINCES THE WORLD CONCERNING SIN.” This portion of the encyclical is very rich and multifaceted and touches upon a very ominous theme: the mystery of sin, iniquity and rebellion despite the “omnipresent” reality of the Holy Spirit who was sent as a special gift (a Love-Gift and a Person-Gift) to convince us of the all-important truth that Jesus is Lord and Savior of the world. The Spirit has been sent, the gift offered to all humanity, to awaken our hearts to conversion and repentance, but in the perversity of our selfish and sin-seeking wills we have the freedom to reject such a great salvation (38). Indeed, as the Pope points out, man is tempted to “falsify” truth by the dark “opposition” of Satan and the “constant pressure on man to reject God….” (38). The Holy Spirit’s convincing about sin is thus rejected as a limitation of man’s own freedom. “In the depths of its divine-human mystery, conversion means the breaking of every fetter by which sin binds man to the whole of the mystery of iniquity. Those who are converted, therefore, are led by the Holy Spirit out of the range of the ‘judgment,’ and introduced into that righteousness which is Christ Jesus….”(48). THUS, according to John Paul II, the sin of blasphemy against the Holy Spirit “consists...in refusal to accept the salvation which God offers to man through the Holy Spirit, working through the power of the cross. If man rejects the ‘convincing concerning sin’ which comes from the Holy Spirit,” he is in essence rejecting the “redemptive power of Christ’s blood” (46). And this “blasphemy against the Holy Spirit consists precisely in the radical refusal to accept this forgiveness [of sin],” and correspondingly the person claims the right to “persist in evil” (46). convincing of the Holy Spirit! 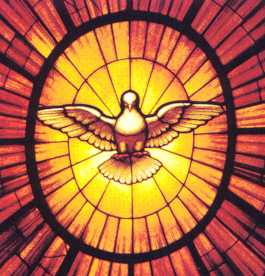 Image: The image of the Holy Spirit is a picture of a stained glass representation of the Holy Spirit as a dove from St. Peter’s Basilica in Rome, circa 1660, by Gian Lorenzo Bernini (Public Domain, U.S.A.).